'Invisible' Children: Raised In The U.S., Now Struggling In Mexico : NPR Ed A growing number of U.S.-born children are returning to Mexico with their parents and struggling in school because they don't read or write in Spanish. Reseachers say the problem is growing. Students engage in a class project at the Escuela 20 Noviembre school in Tijuana, Mexico. Part of our series exploring how the U.S will educate the nearly 5 million students who are learning English. Children and teenagers of Mexican descent make up one of the fastest-growing populations in the nation's public schools. That's a well-known statistic, but less known is that, in the last eight years, nearly 500,000 of these children have returned to Mexico with their families. Nine out of 10 are U.S. citizens because they were born in the U.S. That's according to Mexican and U.S. government figures compiled by researchers with the University of California system, and the Civil Rights Project at UCLA. These families have returned to Mexico because of the economic downturn in the U.S. Many others were deported and had no choice but to take their U.S.-born children with them. In Mexican schools, the single-biggest problem these U.S.-born children and teenagers face is that they can't read or write in Spanish. In the U.S. schools they previously attended, many lacked the academic English they needed to do well. They're often labeled "English Language Learners" or ELLs. Patricia Gandara, co-chair of the Civil Rights Project, has been tracking these students in both countries. She says both the U.S. and Mexico struggle with these transient students, and she says Mexican schools can learn a lot from educators who work with these kids in this country. Gandara and others call these children Los Invisibles: the Invisible Ones. She organized a bi-national symposium in Mexico City recently to discuss the latest research about these children and how best to educate them. You say this has become an urgent issue for both the U.S. and Mexico. Why? First of all, people on both sides of the border don't realize this many children have returned to Mexico from the U.S. Massive deportations and the economic downturn from 2007 to 2009 were big contributors to this. Jobs just dried up, so families went back with their kids. About 450,000 have enrolled in schools in Mexico that we know of. We don't know how many are not enrolled because not all have access to schools. The fact that most of these students can't read or write in Spanish is just one hurdle. Their parents don't know how to navigate Mexico's education system. Mexican schools often don't accept transcripts from U.S. schools. They don't evaluate U.S.-born children in English, their primary language. At least that's what you and your fellow researchers have documented. But your research points to a bigger problem that makes it hard for U.S. born Mexican students to receive the help they need. 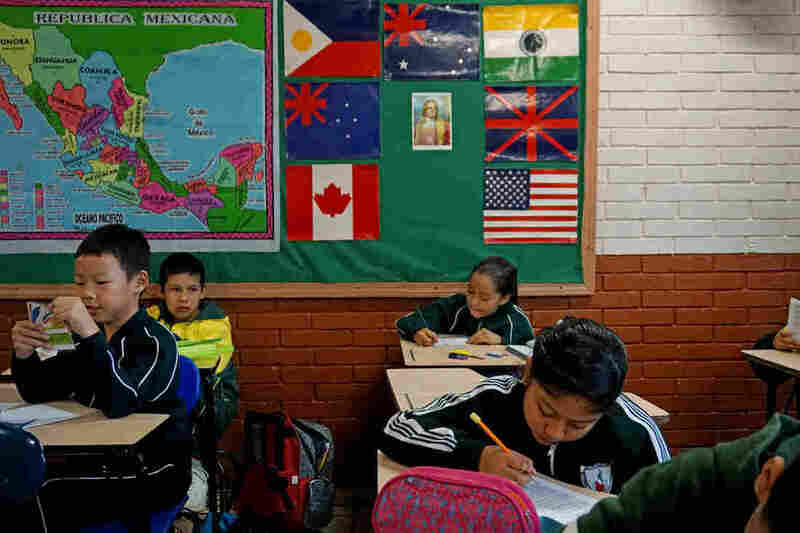 Mexico, not unlike the U.S, also has very segregated schooling and segregated communities. Most indigenous children, for example, grow up [in isolated communities] where the government is not trying to integrate them into the mainstream. The humiliation they experience in school is part of the humiliation indigenous people experience in other walks of life in Mexico. [Now,] there's discrimination targeting Mexican kids who've returned from the U.S., because they don't speak Spanish. 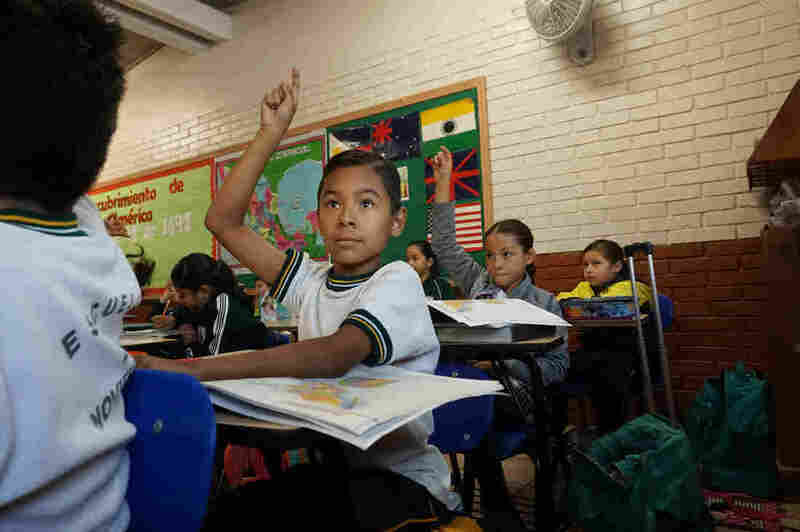 Anthony David Martinez raises his hand in class at the Escuela 20 Noviembre school in Tijuana, Mexico. At the bi-national conference you helped organize in Mexico City, researchers talked about best practices and what both the U.S. and Mexico can learn from each other in addressing the needs of these transient students. But aren't there big differences in how each country approaches language minority students? One big difference in terms of how schools in the U.S. and Mexico deal with language minorities seems pretty glaring. In Mexican schools, the goal is to transition children as quickly as possible to Spanish fluency — because it's the only language that matters. We've tried to estimate the percentage of classroom teachers in Mexico who speak English at a level that they can communicate with these [U.S.-born] kids, and found that fewer than 5 percent in public schools across [Mexico] can communicate with these children. In the U.S., we don't accept the idea that children come to us as blank slates. [Immigrant] children know a lot, but they know it in their primary language, not English. We want to build on their primary language and not start from zero. Also, in the U.S., the English-only, "sink or swim" approach has slowly given way to dual-language programs and bilingual education. Parents today see the value of teaching children to speak, read and write in Spanish and English. But only if it's done right. Poor quality programs can do more damage than good. Finally, you worry that schools in Mexico have been too slow in developing new programs and policies to help these students. So what are you and your bi-national group of researchers recommending that Mexican schools do? Number One: Schools need to welcome parents and help them understand how the [Mexican] system works and how they can support their children. Many of these families arrive with tremendous needs that hinder parents' ability to support their children. Second, schools need to fully assess what children know in their primary language. Too often, a child's knowledge is discarded because its in another language. Educators in both Mexico and the U.S. have to understand that young people who've been educated in both countries can be our future. Whether your primary language is English or Spanish or you live in Mexico or the U.S., we can't afford to lose these children. Its a social and economic loss.